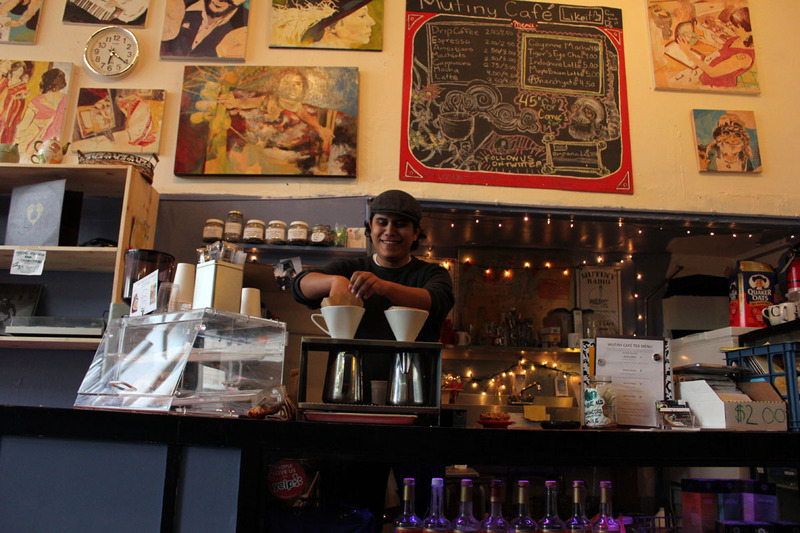 Every day, Enrique Ramirez bikes from his Hunters Point home to Mutiny Radio and Café in the Mission to work 13-hour shifts, seven days a week, mostly without pay. Ramirez owns the café side of the storefront at 21st and Florida streets; the other half is a radio station. And he’s a partner in that enterprise once known as Pirate Cat Radio, now Mutiny Radio. It’s Mutiny Radio’s mission — giving voice to the community — that motivates the 25-year-old, who was born and raised in the Mission and attended UC Santa Cruz. 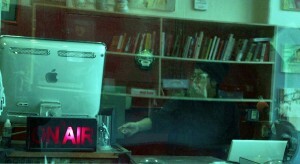 A DJ at Mutiny Radio. Ramirez and the dozens of DJs helped revive the radio station after Pirate Cat Radio’s owner, Monkey, took off for Europe and the station went offline in February 2011. After nearly a year of rebuilding, the station is stable now, said Aaron Lazenby, Mutiny Radio’s program director. To tie up the loose ends, the station is trying to raise $5,000 through a Kickstarter campaign, Lazenby said. The money will be used for rent and other expenses, to keep the station going. Unlike Pirate Cat’s illegal broadcast, Mutiny Radio is an online-only, nonprofit radio station. Some 42 DJs produce and run their own shows, which include a talk show about medical marijuana and a show produced by the nearby Boys and Girls Club. That’s a focus that Ramirez takes seriously. He recently began hosting Saturday morning cartoons for kids at the café as a way to bring families to the shop. The café also hosts open mics and live performances. Ramirez said he’s still in the process of redecorating the place and is curating other types of events. He hopes the café will become a community institution — the kind of place where people can enjoy a cup of coffee without feeling judged. Monkey was such a huge shithead and left so many bridges burning in the city. I’m happy that they are starting anew without him but I’m sure many people still associate that location with Monkey the failure. Life of the entrepreneur: loooooong days, noooooooo pay!! Love that you’re hanging in there! !